This new project is a pre-construction condominium development proposed for downtown Toronto. 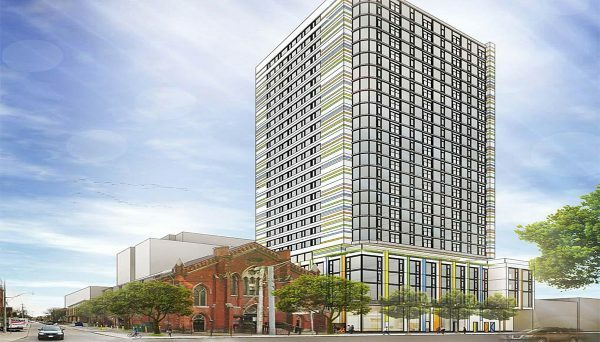 A contemporary tower that incorporates a restored heritage church, 301 Queen Street East Condos is slated for an occupancy date in 2021. 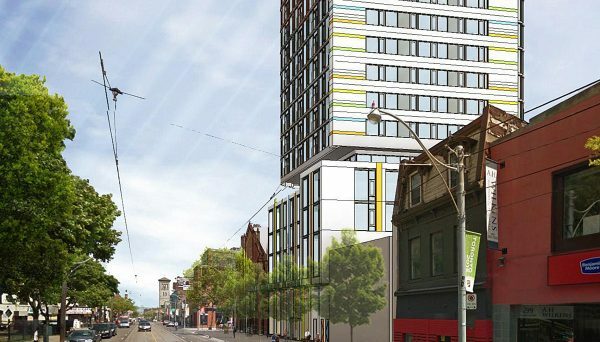 Situated at the southwest corner of Queen and Berkeley Streets, just west of Parliament, the development calls for a 25-storey condominium, plus the preservation of the historic Berkeley Church currently on the site. The church is used as an event space and will continue to be. 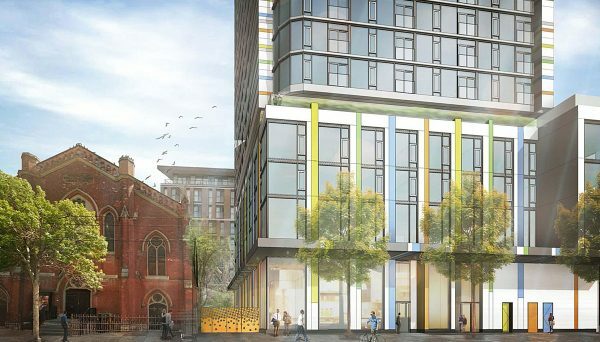 The condominium, designed by Quadrangle Architects, will sit beside the restored church and consist of a four-storey podium with a 21-storey residential tower above. Slender and singular, the tower at this building will feature a playful façade of horizontal and vertical pastel ribbons. The application proposes 2,723 square-feet of commercial space on the podium’s ground floor, along with 8,751 square-feet of retail space on the second floor. The tower will hold 206 residential units in total, including 110 one-bedroom, 74 two-bedroom and 22 three-bedroom layouts. Units on the north and south faces will feature Juliette balconies. Over 4,500 square-feet of indoor amenities will be included on the tower’s fifth floor, which will connect to a 3,250 square-foot outdoor amenity terrace that wraps around the north and west side of the podium’s rooftop. Six levels of underground parking are also proposed for this condo Project housing 98 vehicle spaces and 231 bike storage spaces. This part of downtown Toronto is slated for a stunning transformation and this can be seen in the number of development proposals we’ve seen in the area. As it stands, almost 20 projects are either in the proposal or construction phase nearby. A three-tower development, which proposes high-end retail and office space, is slated for a few blocks west of this building. A short distance north, a luxury hotel and condominium residence is in the pre-construction phase as well. Listed by the city as a “regeneration” corridor, the stretch is well-poised for growth, thanks to its proximity to the downtown core, transit, universities and high-density employment districts. The site scores a perfect 100 on its Transit Score, with the 24-hour streetcar passing by its front door. The streetcar takes you across the entire city and is only minutes to Dundas Station, which connects you with the subway system. Ryerson University is a short commute, as are George Brown College and OCAD University. At this downtown Toronto condo, all the conveniences and attractions the city has to offer are at your fingertips, from world-class dining and shopping to an abundance of entertainment options. Some of downtown Toronto’s most eclectic neighbourhoods are just minutes away, including St, Lawrence Market, Cabbagetown and Regent Park.